Aromatic compounds are considered very stable thus difficult to react. 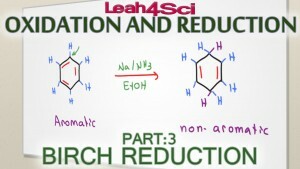 Birch Reduction is one example of an extreme reaction strong enough to break benzene’s aromaticity to form an non conjugated cyclohexadiene. This video breaks down the reaction and mechanism, followed by my trick for quickly identifying the product when EDG/EWG substituents are present.